Wigginton Hall and Pardee Hall are two of the five new residence halls dedicated at Milligan College Friday. 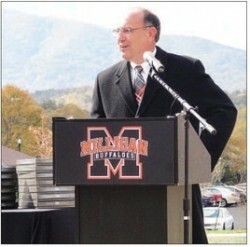 Milligan College President Dr. Bill Greer dedicated the five new residence halls at Milligan College. Student Anna Lennox said living in the new residence hall was a good opportunity she was glad to be able to be a part of. Milligan College celebrated its latest phase of growth with the dedication of the Milligan Village student housing community on Friday afternoon. The Milligan Village has five new residence halls, Hampton, Jeanes, McAnally, Pardee and Wigginton Halls, are named for people who have had an impact on Milligan College in some way. The village complex also includes Burleson Court, a sand volleyball court and outdoor gathering space, and Leggett Lane, the new road to access the village. Milligan Village is the first new residence hall project the college has undertaken in more than 20 years. Greer noted that many people played a part in making the residences for students a reality, including Dr. Donald Jeanes, former Milligan College president who longed to improve student housing. Greer said the new residence halls would have a positive impact on the students. “It was a deliberate design to convey a sense of community,” he said. Director of Residence Life and Housing Kate Anderson agreed that the housing community was an integral part of student life. She said a lot of lessons were learned in the classrooms and labs, but other important lessons were learned in the dorms as well. 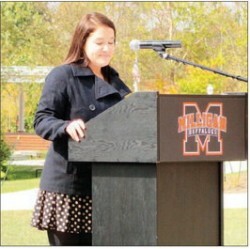 “Community is important to Milligan College,” Anderson said. “It is one of our goals and is in our school mantra. Our goal is to live life together in East Tennessee. There is a tendency to think that Milligan College experience only exists in the four years students are here. The village is a good lesson against that. This is named after people who have been here and their legacy that has created opportunities for students today.” Students Anna Lennox and Corey Hendren thanked the college’s supporters for giving them the opportunity to live in the new student housing. “This is my home away from home,” Lennox said. Hendren said living in the new residence halls was a great experience. Greer also recognized Richard and Leslie Gilliam of Charlottesville, Va., who helped secure funding for the excavation and grading, the construction of roads and parking and the installation of utilities for the five finished buildings and for the seven remaining buildings that will be constructed in later phases as expansion is needed. 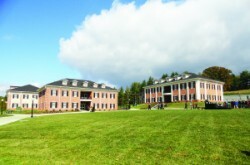 The buildings and other components in Milligan Village are named after people who have had an impact on the college. Hampton Hall is named in memory of two of Milligan’s past professors, Roy and Wanda Hampton. The Hamptons served at Milligan College for 17 years. Jeanes Hall is named for Don and Clarinda Jeanes, Milligan’s president and first lady from July 1997 and July 2011. McAnally Hall is named for Ruth McAnally, a retired school teacher and lifetime member of the Associated Ladies for Milligan. Pardee Hall is named after the original Pardee Hall that stood in Milligan College from 1919 until 1992. Former residents campaigned to have one of the halls named in honor of original. Wigginton Hall is named in honor of Gene and Shirley Wigginton. Gene Wigginton worked as Director of Development from 1971 to 1983. The couple are still Milligan supporters. Burleson Court was named in honor of Burleson Construction, who worked on the village project. Leggett Lane was named for Dr. Marshall and Jean Leggett, Milligan’s president and first lady from 1982 to 1997. Milligan College broke ground on Milligan Village in summer 2012 and the first students moved in during the fall 2013 semester. Each residence hall suite up to five students and includes five private bedrooms situated around a centralized living room and kitchen. It also includes a large commons area.